Poster here. Bring your magnifying glass to read the opener. I’ve talked around this before, but just to be clearer – Super Fly can’t actually turn in his match, because no one on his team is going to lose their masks…right? They’re running commercials for the video game with a masked Elegido, he’s probably not losing, and it’d be odd to unmasked the other guys. Konnan in the 187/FdT match. I guess he would be inevitably and they just want to get his name on the poster. But it still looks odd. Fabi and Pimpi as title challengers makes perfect sense – all the Alex/Pimpi wackiness actually lead somewhere. With Alex finishing up at some point in the next couple months, a title change wouldn’t be a surprise. all the matches could be decent to good and gato eveready cannot catch a break! Interesting that they put Esther on the card over Mari and Cinthia. I guess Mari will get involved in the mixed tag. Is Vampiro done with AAA again? @Tim: Vampiro on their house shows coming up. Maybe they’re backing off him for the moment because he doesn’t quite fit in. Myabe he’ll get involved in the cage match? @thecubsfan: what ever happened to rain? @CM93: She’s a yoga instructor or something stupid. @CM93: She says AAA’s only keeping two foreign women in Mexico at any time, so she’ll be back when Jennifer or Christina need to go home. Dorian’s Twitter said her contract ran out. It also said Kenzo was just temporarily going to Japan and Kenzo signed a 3 year deal with AJPW last week. I’m going with Rain on this oen. @thecubsfan: NO KENZO LEFT :O WHAT TERRIBLE NEWS! i found rain to be better in the ring the jennifer blade err blake. 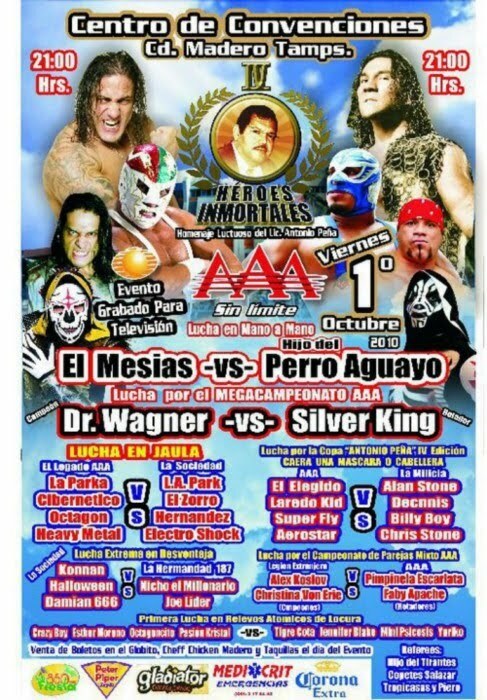 I see that this year the Antonio Pena Memorial Cup is being contested by only mid-card status wrestlers. This is actually a good thing considering that these mid-carders are a hell of a lot more deserving of that prize than any of the previous three winners. I hope Elegido wins this. He is the best of this group and he is the one who most exemplifies an Antonio Pena creation. Not to mention that he is the one with the most star power of that bunch. @CM93: Wasn’t Laredo Kid one of the guys that AAA was supposed to “push”.